I share practical tips to live a simple life on my blog Simply Muslim Mom. I own a handmade Islamic craft shop on ETSY- Figs & Olives. 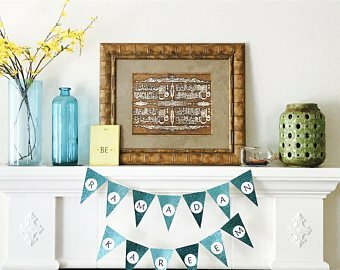 I was a stay at home, homeschooling mom when I opened my shop on ETSY and Simply Muslim Mom. I wanted to do something for myself, to generate an income while being a SAHM. It was a challenge to find something that would generate an income, especially since I wanted something that wouldn’t disrupt the rhythm of my home routine and homeschooling. I also didn’t want to invest a lot of money from the get go. ETSY was perfect for me as I was able create Islamic products from my home, generate an income, while homeschooling my kids. And so was my blog, as I could write at my own pace and time. My inspiration was the stay at home moms who were determined to change their lives through hard work and diligence. One of them started her shop overnight when she had to provide for her family, another mom had a severely disabled child and she wanted to make beautiful things because of her daughter. Moms who work hard to change their lives always inspire me to do better. Yes, alhamdulillah, my family is supportive of my business endeavors. My family members were the first few to subscribe to Simply Muslim Mom. It takes some time for the family members to get acclimated to the change- from seeing you as a mom to a business owner, but they get the hang of it when they see you putting time and effort for your goal consistently. What are the main challenges you face as a mum, a blogger and an entrepreneur? The main challenge is to plan your life according to your resources and abilities and motivate yourself consistently to make the most of both of these blessing. This challenge requires you to be true to yourself, walk your talk and be ready to accept and adapt as you’re being tested as a believer. All of us have challenges in our lives- we were faced with job loss, an unplanned move to another coast that required us to live out of 3 suitcases for 3 months and then start the process of making home in a new city when you didn’t anyone there- it was depressing and stressful at times. The trick is to stay focused, be positive and keep moving to your goal. I notice you are selling on ETSY? Are you looking to create your own website one day? What made you decide to sell on ETSY? ETSY is the market place for makers from all around the world and it feels good to be around people who share your love for making crafts. I sell on ETSY because of the ease of doing business with them. I was not a tech-y person when I started out and didn’t have a lot of time/money to develop a website, yet I was able to create my shop and sell things on ETSY. A typical day starts according to the action items on my planner board. I start listening to Quran while I get to them. A typical day includes taking care of my home and my family- healthy food, clean place etc., homeschooling my kids- at home and outside, and work on a project for my business- either for ETSY or for Simply Muslim Mom. The order of the action items varies from day to day. I like to plan my day, I was a planner even when I didn’t have my blog or business. I take care of the most important things first thing in the morning. When I have orders, I add it to my planner. I have a white board for daily events, and a weekly/monthly wall calendar so I can update my white board accordingly. I also add these events to my phone to run things efficiently. The pro is that I get to run my businesses while being able to homeschool. It’s such a blessing that I didn’t have to choose one or the other. The con is to learn to strike a balance between your responsibilities as a mom, your deen and your business. The sooner you can let go of the illusion of playing all roles perfectly at all times, the better and calmer person you’ll become. Developing reliance on Allah(swt) had helped to keep me motivated. It’s a huge relief to know that I don’t have to do everything alone. Allah(swt) knows it all and can do anything, and He(swt) is always there for me providing support and comfort, alhamdulillah. Where would you like to see your blog and business in the future? I would like to see Simply Muslim Mom to become the “how to” resource for muslim moms. I would like to be able to empower muslim moms- providing practical tips for everyday problems, so they can live Islam more easily and deliberately insha Allah. I would like Figs and Olives to become a resource for handmade Islamic things for muslim homes. Develop a strong bond between you and your Lord. Get to know Him(swt) better through prayers, dhikr and actions. Do the best you can, He(swt) is aware of your intentions and your shortcomings. Include Him(swt) in your business plan to see amazing results inshaAllah. Straighten your priorities. Plan your life around your priorities. There are no failures, only lessons. Learn, turn and move forward- the pace doesn’t matter. Use your time wisely. Carve out time for your goals. Work hard today to make things happen tomorrow. “The harder you try, the luckier you get”. JazakAllah Khair to sister Farhana for taking the time out of her busy schedule to answer my questions! You can also find her on Facebook, Instagram and Twitter. Thanks for such an inspirational article and the tips and words of encouragement. I am new to blogging and I don’t have young children around me so I really admire Mothers running a business. Really empowering. Really inspiring to read! Loved learning more about the sisters home/work life from home – thanks! Alhamdulillah, I am inspired, and have bookmarked this interview for future inspiration insha’Allah. JazakAllahkhayr Farhana and Fozia! Very inspirational to see a busy mum juggling a business from home, it can be so hard. She seems very determined! Will definetly check out the Etsy shop! You are such an inspiration for hundreds of women out there – not just mothers. As a single girl you inspire me to try do more than what I do! Running a blog in itself is almost a full time responsibility but you have branched out and created not just one but two businesses for yourself! Good on you! I loved her advice especially at the end. I have been thinking about how sometimes I have no Barakah in my time and I know it’s because I need to connect to Allah much more. But being a stay at home mom and working from home is amazing and I wouldn’t change it for the world! MashAllah, I really admire Farhana’s work ethic and how she stays inspired through Allah to have severance through any challenges that could come her way. May Allah bless your businesses and reward you for your efforts, amin! This was an enjoyable read, and Fozia’s questions were exactly the right kind to stimulate a provocative discussion from Farhana’s side.